You made me spend in 2010. Here are the products that I couldn't get enough of in 2010. I was encouraged to post my end of the year IT list when I saw that I wasn't the only one who is posting this type of list in 2011 :-). Thanks Just me. I still love the Darcy's Botancial Deep Conditioning mask but there were some others I added to the list. KBB Luscious Locks Moisturizing Hair Mask (I used this in the past when it came up in tiny jars and I have since started using it again- the updated review will come soon). The Brown Butter Beauty hair tea- this is a great natural strengthening aid. XXL Pro mascara from Maybelline- I'll let the pictures speak for itself. AJ Crimson - foundations- I don't even wear foundation but when I was in a wedding my hunt began for the perfect foundation- I found it! Pooka Pure and Simple Body Polish- this is one of the best scrubs I've ever used and the scent is pretty long lasting! They will ahve a special this weekend- All three of their scrubs will be sold as a trio for $18.00. (4oz size jars not the 12 oz). Pooka Pure and Simple bath pastry in Vanilla Sand (yummy scent). Whole Truth Solutions soap - I haven fallen in love with Lemon Sense and Yellow Brick Road but all of the soaps that I've tried were great. The Clairsonic -a million people have reviewed this so I am not sure that I will, but I love it. Many of the other products that I loved in 2010 were products that I had already mentioned on my previous lists, but these were some new standouts for 2010. What were you loving in 2010? For me, the word frugal evokes the image of a dowdy cat lady who pinches pennies. The word just isn't appealing, that is until author, journalist, and financial extraordinaire Natalie McNeal gave the word a makeover. The originator of the word "Frugalista" and creator of the blog The Frugalista Files has finally shown the world how to live life fabulously while on a budget. I couldn't stop sending Natalie tweets when I first started reading through her book, The Frugalista Files. What I love most about this book is that it isn't some stuffy lecture style Suzie Orman (yes I said it) book about financial responsibility. Instead it is one woman's journey to financial freedom while attending charity events, networking, looking great on a budget and hanging out with friends and family. Like me, you may not have financial problems, so why read the book? This book fully encompasses what it means to go on a journey of any sort. Instead of focusing just on finances alone, Natalie takes us through her experiences in navigating her relationships with men, valuing her family & friends, and keeping her balance in an unsteady job market all while facing sky high bills. Some relationships changed while others were strengthened as she stopped leading a financially promiscuous lifestyle. This tongue in cheek book is peppered with suggestions that you can implement TODAY while trying to save a dime. Natalie cleverly weaves in the tips and tricks of saving money throughout this book without ever breaking the rhythm of her writing. I like that it is also a book about a woman who briefly looks into her past to find out how she had landed herself in deep financial waters . She also had to make some tough decisions about living out what had become her vision for her life, versus staying in a somewhat predictable career path that would earn her a steady paycheck. Haven't we all been there a time or two? We can't all be a fly by the seat of your pants, Denise Huxtable type of gal, so throwing caution to the wind by jumping into a venture that may or may not pay your bills is frightening. Each section of this book is written as a page out of Natalie's diary with dates and all so you feel like a fly on the wall in her life. I think everyone can benefit in some way from reading this book, it's a page turner! Available now in stores and online through Amazon.com , Borders.com and other online bookstores. How do you remain frugal and fabulous? I don't recall anticipating the return of a television show as much as I've been eagerly awaiting the return of The Game. So there I sat swaddled in my warm winter covers as I watched the surprising twists and turns in the show's premier episode. Originally I thought they would pick up right where they left off, but then where would the growth have been? During the show's time off the air the producers pressed fast forward and returned the characters to us two years into the future. Derwin's baby is no longer in Janae's womb, instead we have a fully developed bouncing baby boy who gets bathed by Melanie and cuddled by his dad Derwin. The introduction of baby Derwin wasn't the only difference, Melanie and Derwin now have real money, as indicated by references to his endorsement deals and their lavish pad. Kelly has caught the reality show bug as she allows camera crews to follow her every move. She is also intent on doing everything possible to get under her ex husband's skin namely by spending his money. Their daughter, Brit Brat, has been a victim of the old tv switch - a-roo having been replaced by a new girl who seems to be a teenager. Wasn't the original Brit Brat like 10 years old, but this new gal looks much older and she doesn't even resemble the old Brit. Well at least a kid has a job and they didn't pull the old Family Matters trick by completely removing the character as if she never existed. Melanie is still pushy, and passively demanding but happily married to Derwin. She still allows the comments of others to push her to the brink of her own destruction. After a few taunts from Momma Mac, Melanie decides to secretly have a DNA test run on baby Derwin. The results come back confirming Melanie's hope that the baby doesn't belong to Derwin. Against his wishes she shares the results with Derwin only to learn that the original results were wrong and the baby does indeed belong to Derwin. After Derwin's tearful moment over the original DNA results Melanie never reveals that the baby is his son....and so the deception begins! Melanie has her ideal life, the baby is gone since Derwin doesn't believe he is his and Melanie can move on but she knows this lie will always haunt her. I love the new blood by way of Terrance J of 106 and Park and the two timing lady lover played by Meghan Good. It seems like Terrance's character may have a thing for older ladies but he convinces Tasha that he is totally into her and only her. After all, he mentioned that he had been with Tasha for an entire month...smh. lol. I'm not one to knock anyone's May -December relationship but I liked Tasha with Rick Fox because he showed personal growth and I was hoping Tasha would too. I think we will see Foxy again, what do you think? I do hope they add more depth to Meghan's character because at this point the part could have been played by any random tv extra. Oh and Jason Pitts seems like a free agent, not sure if he's still on those steroids. I missed the first 6 minutes of the show. So many people were worried about the show maintaining the quality that we had become accustomed to especially since BET is the devil and all, but they have done a great job thus far. I am by no means disappointed with the new season and I am pleased that they have had a successful return. What did you think about the first episode? you missed the new show "Let's Stay Together". If you were on twitter you likely saw phrases like "Let's Get Cancelled", "Let's Not" and other comical titles. I didn't laugh once so I hope the show isn't supposed to be a comedy. I do like that we have some rarely seen and never before seen fresh faces on the show. I think first episodes on any show should always leave the audience wanting more, but this show just left me feeling regretful over how I could have made better use of my time. Let's Stay Together is about an engaged couple, a married couple and a single woman who has had a string of unhealthy relationships. That in itself shows that the program has a measure of potential but the writers just didn't do enough with the script. We learned that the married husband wants to explore his passion to be a lounge performer instead of staying with his current gig as a legal aid. His wife is lustful over all things expensive but I'm not sure why as she doesn't seem to work. As for the engaged couple the husband is younger than his fiancee, not that I learned that little nugget of information DURING the show, but I heard about it in some interview they did. Anywhoo the engaged couple well I don't really know much about their relationship and apparently the woman doesn't either because she seemed surprised to learn that he had trouble being faithful in his past relationships. Whomp! Just when they were getting to hash out their issue on episode one, I think I blinked and missed the happy ending last night. As for the single sister ,well I like Erica Hubbard and I enjoyed her on Lincoln Heights but this show may not be the platform for her. As for Ron Reaco, it was nice to see him again because I hadn't seen him since he played Tia's HS drop out turned mechanic boyfriend on Sister sister. I wanted this show to work, I really did but I don't know it they can weather the storm of criticism I am sure they will encounter. BET before you push out another show, just call me and I will watch the show and tell you what's wrong with it because clearly your writers have lost touch with the funny. Ok so even if you don't call me, have a small test with a group of people whom you consider to be your target demographic. Just do something before you get my hopes all high only to release a dud. I think I will catch a few more episodes just to give them ratings, at least I will try to even though that plan didn't quite work out for the now cancelled Undercovers. If you watched, what are your thoughts? Side Note to Boris K. modeling only, rapping (click the link and move it to the 6:40 minute mark), and acting is a no no unless you're playing opposite your real like wife Nicole Ari Parker. Did you read that interview where he said he wants to be respected not for his looks but for his acting ability? Well then get an acting coach so I can respect you, heck read lines with your wife - do something because you still don't fully open your mouth when you speak and you bore me as an actor. Cute face though- thanks and goodnight to you sir. Evelyn, Evelyn, Evelyn, where for art thou tongue? This lady was instantly mute when Tami launched into a bare foot, outraged, food stamp supporting tirade all in Jen's face. Evelyn the tough girl from the Bronx said not a word that would get Tami more upset, she just tried to peacefully end the disturbance. Hummm I guess she forgot she's from the Bronx. If anyone thought that Tami was tacky and inappropriate, she confirmed all suspicions as she went crazy during a charity event. Ummm can we really call it a charity event when only five people were in attendance? We got a chance to see Ashley again since she was the organizer of the event, but I am a little confused by her. Ashley did the right thing by not inviting the drama twins Evelyn and Jen but she seems to answer far too many questions for women who are not her friends. Oh yeah and the most confusing of all is that she said she invited people who could and would support the charity through donations but broke as a joke Tami was invited- huh??? Maybe Ahsley was just being nice on that account, but she should have had security help Jen and Evelyn find the door once she saw they were in the house. Suzie- I understand her desire to flee from drama but at the same time she was enjoying herself so why leave just because the grouch entered the building? Royce, I love that she put her tiny 5 digits right back in Tami's face at the event. Tami is a mess, there is no other word that can be used to describe her behavior. She clearly knows neither the time nor the appropriate place to hash out differences with her cast members Perhaps the same problem emerged during her marriage...just saying. She also showed that she is a fast loud mouth by telling Evelyn and Jen why they weren't invited as if Ashley who was standing right there couldn't express that herself. Tami was also wearing a dress from Rainbow- the end. Shaunie it's called separation, you did it with your husband initially so you understand the rules, now just apply it to your toxic best friends. A midget with money- case closed. She likes Floyd very much but he's just not that into her. He likes to have her around but he won't marry her. He gives her HS - excuse me, Junior High School excuses to avoid committing himself to her. He took her on a date to six flags but I wouldn't really call it a date since all of his friends were there PLUS chilli..lol He wasn't even taking the time to walk with her, I think she is just one of the boys to Floyd. She also doubles as his back up plan in case he decides to wed years from now in his old age. Tatiana recently did an interview explaining that her show Love that girl will be back on the air soon. Who asked for the return of that show, it was HORRIBLE to say the least. Oh well- anyone going to watch it? What are you watching on the tube? I watched some prime time classic tv over the weekend and I hope you did too. Am I talking about some digitally remastered classic film that can only be found on the Turner Movie Classics channel? Nope, I'm talking about BASKETBALL WIVES. Yup you read correctly, I was glued to my seat as I watched every second of that drama filled episode. Shaunie- I am so disappointed with her this season because she has a totally different vibe. During the introductory season Shaunie seemed like the listening ear who never really picked sides but liked to give everyone their fair shake. She was more like the Queen Bee who never really got her hands dirty but this season she seems a bit more catty. During the last episode she sat down at Gloria and Suzie's table grilling Gloria about her never going to happen wedding date. Even though I am by NOOO stretch of the imagination a fan of Gloria, Shaunie's badgering did make her look a little bitter, and miserable. Have you nothing better to do than to run around town with your three sidekicks looking to start some mess? When Gloria said - "well you did put on that wedding dress and now you're divorced and miserable"- I said ok one check for Gloria and an "excuse me but you have egg on your face" for Shaunie. The lesson of the week for Jen is think before you speak. Jen sat at the able with all of the ladies and asked Gloria- why would I be jealous of you, because you had some babies out of wedlock?" I'm at home thinking hummmm that snarky remark may have had an impact on Gloria if A) your main Ace Evelyn and Royce were not in the same situation..whomp. And B) - if your marriage were not crumbling more each minute that remain married. double whomp. Her second foot in the mouth conversation came when she spoke with her husband. Don't open up the divorce conversation if you're not really ready for what your man has to say. She casually sat back and thought she would have some soul searching moment with her husband when she said- well we can talk about it (referencing divorce) and Eric replied- "there ain't nothing to talk about -if you don't like your situation LEAVE the situation". WHOMP WHOMP WHOMP- but so true. Maybe she is waiting by Eric's side thinking that some tearful remorse filled dialogue will one day happen, but it won't - at least not on tv. Eric made a few valid points, he referenced last seasons episode when never going to get married Evenly was encouraging Jen to cheat on her husband- he clearly wasn't a fan..lol. Also he said she stays out every night, well if that's the case then can you really be upset when he stays out? Let's face it neither of them are handling the situation like adults but Eric made no bone about it this past Sunday- Jen can feel free to BOUNCE at any point. He even started to divide up the assets before Jen even realized how far the conversation had gone..LOL. Now I'm not one to laugh at another person's misery but that was funny. I give it to Eric for being honest at least in that moment. Suzie I don't see a big tv career in your life unless you will make reality tv your bread and butter. Royce- dear little Royce it annoys me when people try to force others who are having an argument to just get along. So I'm annoyed by her constant " are you coming to the event" knowing that Evenly just wants to chop Suzie's head off. Evenly takes things too far and just likes to pick on the people who she considers to be weaker. After exclaiming "I'm from the Bronx don't play with me" those LA girls seem to run scared. However, the preview of upcoming episodes have helped me to appreciate that her "I'm from the Bronx" line doesn't make a "Real World" Veteran like Tami run for the hills. *fists will fly. Tami- your wig which you clearly cut yourself offends me..- the end. Gloria- Please don't think we are all idiots...lol your wedding date was not called off because your guest list went to 280 people nor is it because you are moving. Knock it off. side note- Is the therapist that Tami went to see on the VH1 payroll , because that is the same therapist that Jen will visit next episode..... #justwondering. Have you been watching this season? What are your thoughts? UPDATE- on a popular website, theybf.com, Shaunie speaks out to explain the bad on air behavior of the basketball wives. If you're in need of a new cell phone case and you have an iphone, Sephora's got you covered. 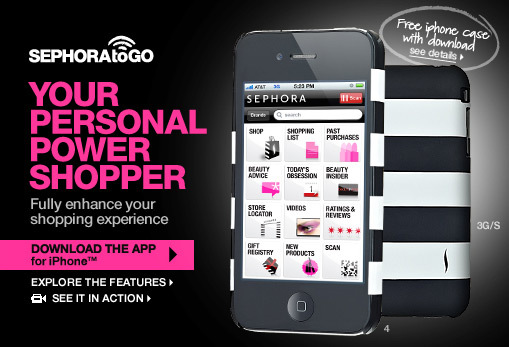 You will have to download the Sephora To Go app. Once you download the app simply show a Sephora sales representative and you will be given a free Sephora iphone case. No purchase necessary- while supplies last. I called my local Sephora and it's in stock so check out your local Sephora. How much is too much for a bottle of nail polish? If you had asked me that question about a year two years ago, I probably would have said $8-$10 is a reasonable price for a bottle of GOOD polish, until I ran across Deborah Lippmann polishes which are priced in the $16-$21 range. Even though I didn't buy the DL polish when I first learned of the brand, I would be lying if I didn't admit that the price tag left an impression with me. Is it really that good that it's priced so much higher than regular polishes, in fact it's nearly double the price I pay for respectable brands like Opi and Essie. I actually vowed to not spend my hard earned pennies on such an expensive polish, but thoughts of that DL polish kept dancing in my head. The only thing that kept me from getting the polish is the fact that the colors at that time were so regular, nothing special about them, in fact I had a couple of dupes sitting right in my nail polish case and then it happened. What's a girl to expect out of an $18 polish? Well I knew that it wouldn't last forever but I was expecting it to be the longest lasting polish that anyone could ever envision. I knew that people would have to stop me in the street and say "Girllllllll where did you get that polish? ", yes my nails would have to stop traffic if this purchase was going to be worth it. Let's just say I had high expectations, so forgive me if I judge this polish harshly..lol. Overall I like the look of this polish and it is unique in appearance. Check it out on my nails in the pic below. The oil on my hands makes this polish look a little shinier than it actually is- this polish needs a clear top coat to really pop. In all honesty, the lasting power of this polish extends far beyond the limits of any Revlon or Sally Hansen polish. Does it beat OPI and Essie- not so much they are pretty much on par. I can get a good 6 day run out of the Deborah Lippmann polish, I can even eek out 7 days if I'm not shooting for total perfection. So I was happy with the polish but only after 2-3 coats. This is not a 1 coat polish, which for $18 it should be in my humble opinion. I want each stroke to deliver lasting coverage and colorful impact. Check out my nails in the picture below with a single coat of Bad Romance and Ruby red Slippers. Not mind blowing at all, right? In fact what this helped me to appreciate is that this polish is nothing more than black nail polish with a high concentration of brightly colored sparkles thrown in the bottle to make gals like myself squeal. Now I'm in business, 2-3 coats will do the trick! Not long after I had made my peace with this $18 polish, did the sparkles make me feel a twinge of regret. FRAUD FRAUD those purple and red sparkles that glisten so brilliantly in the bottle are really silver sparkles. Well how do you know that PJD? Thanks for asking ladies, I know because after washing my hands and bathing, both of which I do regularly, the purple and red coating of the sparkles will begin to peel off. Now where they go, I don't know because it's not like I see purple and red casings on my floor but they definitely peel off of the sparkles. The problem is, I'm not left with polish that clearly has days worth of wear left but now I have random silver sparkles in a sea of black polish with colored sparked so the random silver sparkles stand out and not in a good way. Although it doesn't show up so well on camera, I had three silver sparkles on my index finger while all of the other sparkles were still painted purple. Overall it just diminishes the appearance of the polish. I don't see myself running out to buy another bottle of her polishes unless I see a super discount. I'll stick with my "Bring on the Bling" by OPI if I need a little sparkle in my life. Have you used Deborah Lippmann polishes? If so, what was your experience? What's the highest you would pay for a bottle of polish that was calling your name?